The Bahamas is the newest signatory of the Hamilton Declaration on Collaboration for the Conservation of the Sargasso Sea. Frederick A. Mitchell, Minister of Foreign Affairs and Immigration of The Bahamas signed the Hamilton Declaration at The Bahamas Mission to the United Nations in New York City. The Hamilton Declaration was originally signed in Bermuda in March 2014 by five governments – The Azores, Bermuda, Monaco, the United Kingdom and the United States. The British Virgin Islands signed in January 2016. The Bahamas is the seventh signatory. The Hamilton Declaration is a political commitment by the signatories to work with the Government of Bermuda and the Sargasso Sea Commission to conserve the Sargasso Sea —the high seas ecosystem in the North Atlantic sub-tropical gyre. This unique ecosystem—nearly 5 million square kilometers in area—is based on species of seaweed, Sargassum. The Sargassum mats and windrows act as a major spawning and nursery area for threatened and endangered species, including sea turtles and billfish, as well as for important commercial species of tuna, wahoo and dolphinfish. It is the only place in the world where the European eel and the American eel spawn. They then migrate 3,000 miles back to the continents of Europe and North America. The Sargasso Sea Commission is appointed by the Government of Bermuda after consultation with the other signatories. It is composed of “distinguished scientists and other persons of international repute committed to the conservation of high seas ecosystems that would serve in their personal capacity.” The Bermudian commissioner is Dr. Tammy Trott. 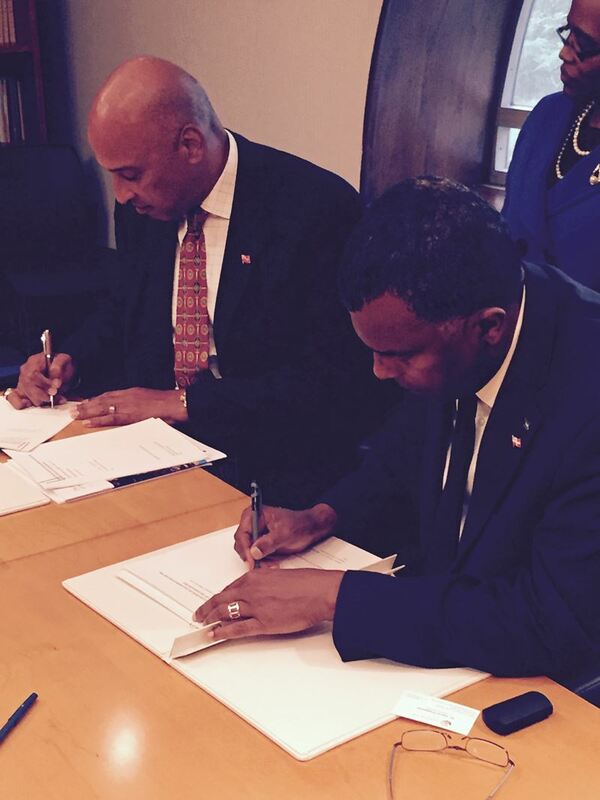 The signing was witnessed by the Minister of the Environment, on behalf of the Government of Bermuda. Dr. David Freestone, Executive Secretary of the Sargasso Sea Commission, added, “The signing of the Hamilton Declaration in 2014 was an historic event in the move toward conservation of the high seas.